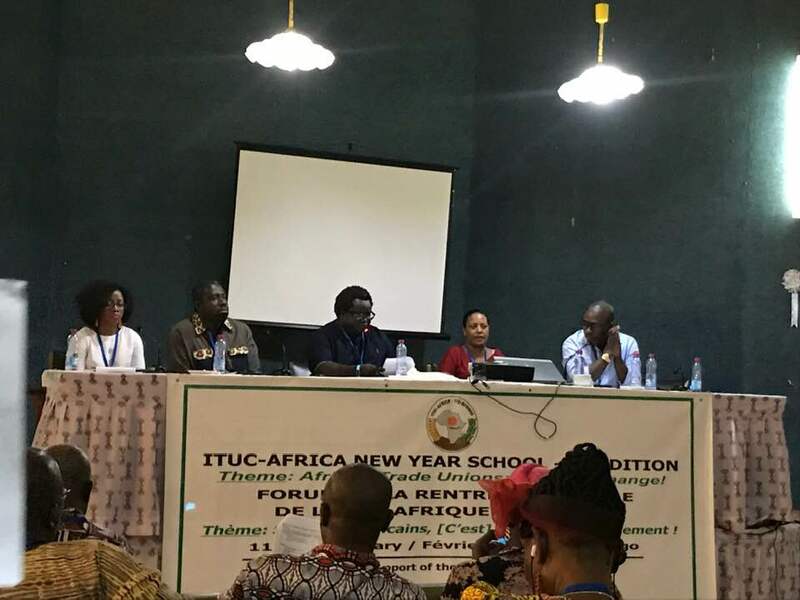 The ITUC-Africa New Year school (NYS) 2019 “African Trade Unions: Time for change!”, organized by the ITUC-Africa through its Research and Education Institute (ALREI) and funded by the ILO ACTRAV and FES, took place on 11-15 February in Lome city, Togo. Around 100 participants attended the school primarily from the ITUC-Africa affiliates, comprising General Council members, ITUC-Africa Women Committee and Youth Committees; the sub-regional trade unions organizations, labour researchers and educators, Global union federations (GUFs); continental and international CSOs, academia and media amongst others as well as ILO representatives. Oksana Abboud, StreetNet Organizer and Trainee-Coordinator represented StreetNet at the ITUC-African School. To formulate a continental labour strategy to build strong and united trade union organisations that can assist in fostering economic and social transformation in Africa. In the development of the modern state, from the colonial era into what can be described today as the neo-colonial era, the systems of governance and institutions of public authority that have emerged often do not serve the interests of the working people. As a consequence, the trade union movement in Africa today is confronted with enormous challenges arising from the political and socio-economic realities confronting Africa and its people. Trade union leaders got together to discuss the main challenges they currently face: Decreasing working class consciousness; Limited trade union structural power and low visibility and influence owed to low trade union density and Membership disfranchisement; Deepening disconnect between membership and leadership; Fragmentation, Low capacities to engage various stakeholders; Growing internal un-democratic practices; Lack of political independence and growing elitism within unions; Low financial independence and absence of sustainability strategies; Limited understanding and inclusion of the diverse needs of the membership (e.g. youth, women, workers with disabilities, informally employed); Poor expression of solidarity with those in need. Within 5 days school the African trade union leaders were identifying and analysing best possible solutions to the current gaps and opportunities they encounter in their activities and union work. Main focus area of the school was devoted to the trade Union Unity; Democratic Governance in Trade Unions; Trade Union Membership and organizing; Building (financially) sustainable/autonomous trade union organizations. Mody Guiro, the ITUC-Africa President and Kwasi Adu-Amankwah, ITUC-Africa General Secretary, welcomed the New Year School participants and encouraged them to express new ideas, approaches and plans on a way forward for the sake of protection workers’ rights and interests in a new era. A key note was addressed by Fackson Shamenda, Former Zambian Minister of Labour and Social Security, former President of the International Confederation of Trade Unions (ICFTU) and the Zambian Congress of Trade Unions (ZCTU), who noted that trade unions have to get their space back as unions who protect workers’ rights, as nowadays many NGOs started to talk about the workers’ rights instead of trade unions. Bastian Schultz, Director of the Trade Union Competency Center, FES Sub-Sahara Africa joined the school on behalf of the FES. Bastian pointed on new challenges which bring social inequalities, also noting that trade unions need to be stronger as in order to respond to transformation, we need to transform ourselves first. Hilma Mote, ALREI Executive Director, Africa introduced the ITUC-Africa study which was conducted in 9 countries covering at least 3 sub-regions of the African continent and targeted national trade union centres. During the school different methodologies have been used. Working in different thematic groups was very interesting and useful exercise as trade unions had a great opportunity to share experience, lessons and set up a new revised plan of possible actions towards many issues. Gender and Women’s Empowerment in trade unions, youth and informal economy workers – those are key words which had its discussion and feedback from different stakeholders within the school process. Oksana Abboud in her presentation introduced StreetNet structure and main strategic focus areas. She presented a practical work which StreetNet is doing towards Organizing of informal economy traders, street vendors and hawkers as well as briefly introduced StreetNet approach towards negotiations skills course designed for informal economy workers. Oksana raised several issues where StreetNet and trade unions can co-join their efforts and overlap in their activities. It mainly related to the implementation of the ILO Recommendation 204, inclusive social dialogue at national level, solidarity support as well as joint educational programs and strategies. Discussion on new approaches and strategies towards trade union education and how it should be designed in current realities, has been conducted during the Thematic Group work on rethinking trade union education. The participants while working in parallel commissions were tasked to develop strategies on Trade union unity, Membership, Trade unions and Politics as well as on Trade union governance and internal democracy. The School was very informative and interesting due to its diversity of thematic areas as well as the diversity of participants’ background. Next PostNext 6th StreetNet International Congress 2019! Unity is Our Strength!